With the excitement surrounding the game today, us fans knew that we were in for a good game. A match between two of the greatest clubs in footballing history was certainly not going to disappoint. 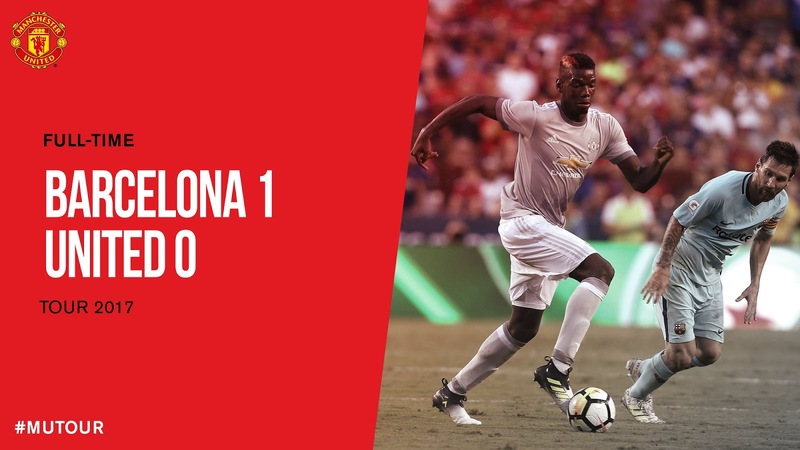 This was the biggest challenge for United in pre season as they came up against the deadly strike force of Messi, Suarez and Neymar. This proved to be a real challenge. Both teams started the first half very well and were clearly in the mood to attack and score goals. Although it was just a friendly, both teams were competitive in their approaches and had several shots on goal. Barcelona grew into the game to the point where United were finding it really difficult to break out and keep possession. David De Gea was exceptional and made several world class saves to keep United in the game. In the 31st minute the deadlock was broken by Neymar. Although he is the talk of the transfer window and there is constant speculation regarding his future, he still showed that he is focused on his football and is one of the best players in the world. Some scrappy defending by United led to Neymar scoring from close range. United were unable to grab an equaliser before the break. The second half was all Manchester United and Barcelona were finding it difficult to create chances. Despite our masses of possession in the final third, we were still unable to find the final ball or a clinical finish to get the equaliser. It was a poor attacking performance overall in that second half as United were unable to break through the Barcelona defence. Towards the end of the game, several chances were presented to us but poor finishing was the issue and the game finished 1-0 to Barcelona. Although the result today was a loss, it was still a decent performance by the lads. We could have easily won that game and there were several bright spells. There should be some good times ahead for us United fans. Today's game was the last of the International Champions Cup in the USA and our next fixture is on Sunday against Valerenga. The Norwegian opponents shouldn't pose much of a threat to us and we should use this opportunity to start some of our young players and give them a chance to show their worth. Let's also not forget that there is roughly two weeks left until the start of the Premier League season so it looks like we'll be in for a treat.